B&O Beolab 50 review | What Hi-Fi? Purists may be tempted to dismiss Bang & Olufsen’s Beolab 50s as a style-over-substance product. Just one look at them is enough to understand why. But behind all the glitz of rising tweeters, fancy cabinet shaping and wood-lined grilles you’ll find a depth of engineering seldom seem - even at these prices. Each speaker packs a digital-to-analogue converter, an analogue-to-digital converter, a preamp and seven drive units. There’s a dedicated 300W power amplifier for every driver. If all that sounds excessive, we haven’t even mentioned the motorised tweeter pod yet, with its adjustable acoustic lens – or the built-in digital signal processing that allows the speakers to adjust their balance depending on listening position. B&O appears to have thrown its full technological might at this product and has come up with something rather special. Not flawless, but massively tempting nonetheless. 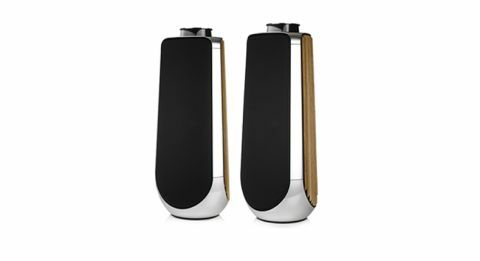 If you do buy a pair of BeoLab 50s, they should be delivered and installed by the dealer. It’s just as well because these are hefty things, weighing in at 61kg each and standing at almost 104cm tall. Despite their size, the unusual shape and cosmetic treatment means they don’t look overbearing in our listening room. B&O has put a lot of effort into making it easy to sonically integrate the 50s into a room. As a starting point we’d suggest a free space placement, well away from any wall. From there they can be calibrated to deliver an even tonal balance at the listening position. This fine-tuning should be done by the dealer and will come at additional cost, unless you can negotiate it as part of the deal. It’s possible to optimise the sound for a number of different listening positions – if you move from, say, the main listening chair to a sofa on the other side of the room, the speaker’s sound can be switched accordingly to optimise the presentation for your new location. While stereo imaging will suffer from such a move, of course, the overall balance will stay broadly the same. It’s a handy feature, and only possible thanks to the 50s’ built-in digital signal processing and clever software. The speakers will not only even out frequency peaks and troughs caused by room interactions, but also alter dispersion characteristics by varying the focus of the tweeter’s acoustics lens and changing the balance of the various drive units. The idea is to make the BeoLabs as unfussy about the room as possible, and to make them sound good regardless of where you sit. In this, we think B&O has been wholly successful. We can’t think of an alternative that's in any way as accommodating. Take off the three grilles and you’ll find the 50s to be positively brimming with technology. Each channel has three 25cm bass drivers – one for each of the three faces, and each at a different height from the floor to spread reflection effects. There is a trio of 10cm midrange units on the front panel, which, along with the bass drivers and 19mm tweeter, are each driven by a dedicated 300W ICEpower Class D module. We calculate that’s 2100W per channel, which should be enough power to deliver party levels in just about any room, regardless of size. Indeed, in our listening room we’ve never had a speaker that goes quite so loud quite so easily. All the connections are hidden in a compartment near the speaker’s base. They’re tucked away well enough for us to wish B&O had specified an internal light to make things easier. There are a good variety of inputs ranging from USB (24bit/192kHz), coaxial (24bit/192kHz) and optical (24-bit/96kHz) right through to stereo RCA line-ins. If you need extra connectivity, not to mention multi-room or streaming ability, you’ll have to shell out further for B&O’s system hub, the BeoSound Core (£595). There’s a dedicated app for the BeoLab 50s, of course. Something this heavy with technology needs one. The app is nicely arranged and, for the most part, logical. It deals with the set-up of the speakers and allows the user to make sonic tweaks when required. It also controls the volume level which, if you’re using the same tablet (or phone) to control the source component, can involve a bit of juggling to account for different recording levels. There were many times we wished for an old-fashion handset to make such basic changes as we toggled between our Naim NDS/555 PS music streamer and the BeoLab 50s. Once properly optimised, these are impressive speakers. We start with Bizet’s Carmen Suite and are stunned with the effortless way they deliver large-scale dynamic shifts. All that built-in power does wonders when it comes to rendering hard-hitting crescendos, but it also gives these B&Os a rare sense of composure. There’s no shortage of control, and it’s coupled with an ability to track a multitude of instrumental strands with getting confused. Stereo imaging is good. Provided the speakers are in their most focused setting, the BeoLab 50s lock instruments in position on a relatively expansive and spacious sound stage. It’s the stability that really grabs our attention though, as everything sounds solidly planted even when the music becomes demanding or volume levels rise. Given the amount of processing carried out, it comes as no surprise to find these B&Os sound tonally even. That’s not the same as neutral, though - the speakers retain the company’s trademark smoothness at higher frequencies and a hint of fullness in the bass. None of it is taken too far, and on the whole it just makes the speakers relatively forgiving of poor recordings. There are no obvious frequency peaks or troughs at our calibrated listening position, despite bass that’s delivered with immense power all the way down to a claimed 15Hz. We take advantage of that by blasting out the likes of Massive Attack’s Angel and Hans Zimmer’s Interstellar OST at high volumes. The BeoLabs are class-leading in so many ways with this kind of music. They deliver really deep bass with such ease and agility. They never sound stressed when doing so, and keep their composure at very high volumes levels. We can’t recall a speaker sounding so effortless when pushed hard. They’re not perfect, though. Despite good detail levels, these speakers never sound wholly transparent. The differences in recordings aren’t as clear as they should be, so when we shift from something intimate like Martha from Tom Waits to Arvo Pärt’s Tabula Rasa, the changes of recording acoustic and production simply aren’t as obvious as they should be. We gradually become aware these speakers aren’t blessed with great rhythmic precision either, so the musical momentum of Angel or the growing tension of Tabula Rasa are both somewhat muted. While we’re stunned at the BeoLabs' ability to deliver large-scale dynamic shifts, they’re less successful at conveying the subtleties. The nuances of Tom Wait’s voice – the ones that make listening to Martha so heart-wrenching – are smoothed over, reducing the song’s musical impact. No piece of hi-fi is perfect, and the BeoLab 50s are no different in that respect. If you want a super-stylish set-up in the minimum of boxes, one that's little short of awesome when it comes to volume levels, large-scale dynamics and outright composure, well... we haven’t come across better. Particularly when you consider the B&O’s ability to sound and look good in most rooms. For some, just the look on their friends' faces when those tweeter pods rise or the acoustic lens moves will be enough to sign off on the deal. None of the more purist (and let’s not forget, more insightful) high-end alternatives can come close to offering glamour like that.